Commissioned for Cloud Nine Theatre, HADAWAY is about the life of writer (and friend) the late Tom Hadaway, on the docks of North Shields. It was written for the Tom Hadaway Festival held in his birthplace, the only play about Tom's life to be performed. Full of tragedy and humour, violence and beauty, the sea is always present as in most of my plays. Tom wrote of working people in poetic yet hard-hitting plays. 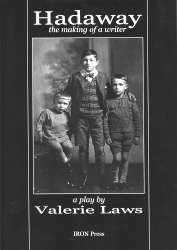 The script of the play was published by Iron Press. I co-wrote AU SECOURS, this innovative French course, in response to modern languages becoming compulsory, and it used up-to-date, useful situations, with minimal grammar, but a lively and amusing style, listening, speaking, reading and writing. It was devised for less academic achievers but, with Teacher's Book, tapes and activities folder, became a huge best-seller nationwide for years, as schools realised a little grammar from elsewhere, and students could do well in GCSE with just this course instead of the bigger more expensive course from the publisher MGP/Stanley Thornes. Hence why the publisher didn't revise and re-release! though it still gets photocopied and used. The German equivalent course HILFE was also wildly successful.